Behavioural Ecology Research Group - Tool Use - Field Research - "crow cams"
We have developed miniature video cameras weighing only 14g (just a bit heavier than a £1 coin!) 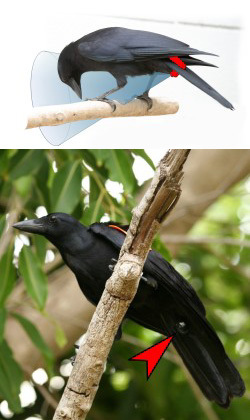 that we can fit to wild crows to record their natural foraging behaviour. These cameras are attached to two central tail feathers, with the lens bent forward peeking through the subjects' legs to provide a "crow's-eye view" of the world (see photos). The camera transmits live footage for 70 minutes, and is safely shed with natural moult. We have recently published a paper in Biology Letters, in which we provide the information necessary for other field biologists who wish to begin video tracking their own study species. The main article and supplementary text are a quick introduction to selecting the right components, constructing units and video-tracking wild animals. Biology Letters has been kind enough to make this paper freely available for 2 months post-publication. The results of our first season using these cameras were published in a 2007 paper in Science. We discovered that, in our study area at least, the crows' natural foraging efficiency is surprisingly low, possibly going some way towards explaining the evolution of tool use in the species. We also observed crows using tools to probe into the soil, which has never been reported before, and using a novel tool material – dry, grass-like stems. Furthermore, one crow (EK1 – see Movies) transported a tool for a considerable distance (>100 m), indicating that crows may keep particularly 'good' tools for future use. 'Video-tracking' with cameras like these has potential for studying the behavior and ecology of many other bird species that are shy, or live in inaccessible habitats. Crowcam schematic (WMV, 8.3 MB) - an animated, guided tour of a 'crowcam' unit, showing details of on-bird mounting and unit construction. Please contact with any enquiries. "Einstein 3 April 2008: Minikameras f�r Kr�hen"
"Clever crows are caught on camera"
"Tiny cameras give new meaning to 'bird's-eye view'"
"Tiny 'Crow-Cams' Capture Tool Use in Wild Birds"
"The Secret Lives of Tool-Wielding Crows"
"Tool use by shy crows caught on camera"
"Crow Cam Captures Creative Behavior in the Wild"
"A Bird�s-Thigh View of Tool-Making Sheds Light on Crows"